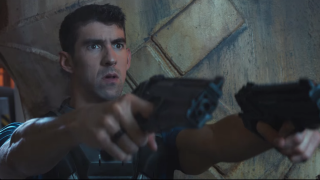 With just over a week until release, Activision has dropped a live-action trailer for Call Of Duty: Infinite Warfare – and its ludicrousness can be summarised in two words: Michael Phelps. Yes, it's lead star is certainly famous for the manner in which he pumps his guns – but usually down the local swimming baths, rather than on a war-torn space station. The vid is called 'Screw It, Let's Go To Space' and sends up this year's unending run of doom-tastic news masterfully – I laughed hard at the headline 'Canada builds wall'. It was directed by Peter Berg, and also stars US comedian Danny McBride. Everything else is gunfire and noise and more gunfire, which in fairness is Call Of Duty in a nutshell. Just with 23 more Olympic gold medals than anyone is used to. Call Of Duty: Infinite Warfare is out on PS4, Xbox One and PC on November 4.